BEFORE: Margin Call was originally scheduled to take place after Glengarry Glen Ross due to some similar themes (read: money), but it was pushed back due to some last-minute adjustments. Like Glengarry Glen Ross this also stars Kevin Spacey and features a whole bunch of other great actors such as Paul Bettany, Jeremy Irons, and Stanley Tucci. AFTER: Ambiguity is a tricky area when telling stories. Some ambiguity leaves the viewer questioning what happens and engaging more with the story. But too much ambiguity and it just leads to a pile of confusion with no idea of what is going on. Margin Call lands on the too ambiguous side of the line. I like to think I know at least a little about economics and the stock market. While I am by no means an expert I do follow the financial news from time-to-time. Even with some background knowledge, I felt left in the dark with what was going on in the film. It’s pretty obvious something bad is going on but it’s not crystal clear what exactly is happening. There are many times where I’m left puzzled at what a character just said, not just because of financial mumbo-jumbo, but because things are brought up and then not explained. Another complaint I have about the film is about time. The investment firm works around the clock from dusk ‘til dawn with no signs or mention of fatigue. Nobody looks or acts tired, there isn’t a large amount of coffee being consumed; it’s as if these people don’t need to sleep. This just adds an unrealistic feeling to the film and makes it harder to believe what is going on is real. There are some shining parts to the film, mostly the acting. It’s a great ensemble cast that works extremely well together and raises the film from the depths a bit. 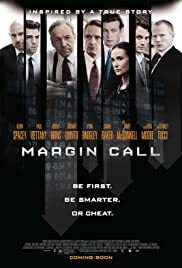 But, the story issues make it hard to recommend Margin Call.